How does one start a critique on a show like Gino Fabbri is Completely Nuts? 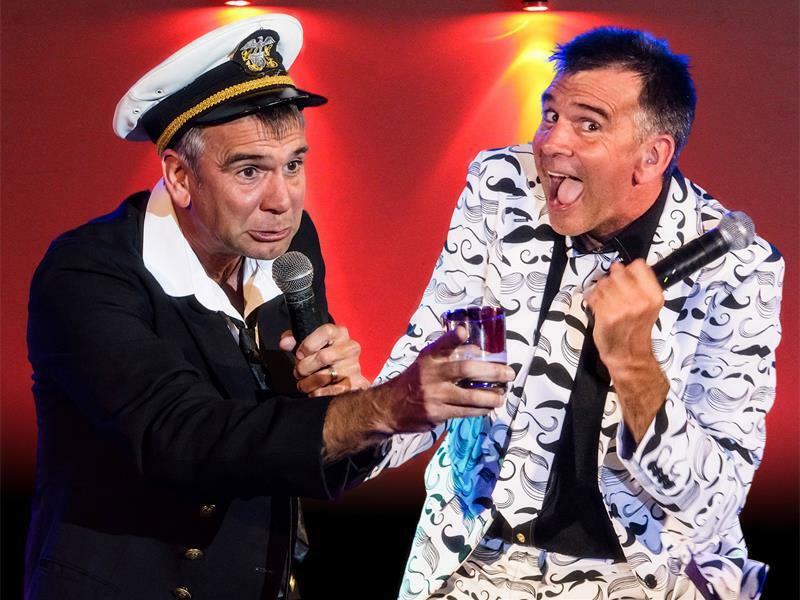 currently playing at Durban’s Elizabeth Sneddon Theatre, this one-man show by Eastern Cape comedian Gino Fabbri could easily have been titled Gino Fabbri is Completely ….. Pick whichever one you prefer, but all of them apply. This is Fabbri’s first performance of his solo show in Durban, and it’s a madcap, energy-intense, laugh-a-minute romp with a cast of zany characters, starting with Minuta Peniso (yes, folks – maybe you should leave the kids at home for this show) who regales us with stories of how he passed his prospective father-in-law’s test when asking for his daughter’s hand in marriage (an old joke, but very well put across), his wedding night, and his mother’s cleverly-titled restaurant dishes, with a couple of Italian songs thrown in for good measure. And yes, apart from being a consummate comedian, this boy can sing! Video clips with a score of characters and one-liners (some old, some new, but all funny) cover his costume change to a local traffic cop and training officer in very tight short shorts, who punctuates most sentences with hip thrusts, causing much hilarity amongst a very appreciative opening-night audience. Next up is Clyde Smithers, Entertainer Extraordinaminaire (and no, that’s not a typo!) who reminded me of local comedy genius Aaron McIlroy in terms of his mannerisms, delivery and throw-away lines. If Fabbri has indeed used McIlroy as a role model, he couldn’t have picked better. For the whole show, a set of drums has sat silently upstage, but its purpose becomes clear as Fabbri adds his own pulsating rhythmic punctuation to a well put together compilation of classical music to bring the first half to an end. “Sacrilege!” said a classical aficionado who was part of our group, but even he had to admit that it was very cleverly constructed and performed. Add drummer extraordinaire to the list of Fabbri’s talents. The second half introduces us to Rancid Punjabi, who gives us driving tips (“take the windscreen wipers off your car, so the traffic cops have nowhere to put the ticket”) and a social media survival course, which includes “the blue ticks of death”. Somewhere in the middle of the sequence, he throws in Mambo Number Five and ends it with Cotton Eyed Joe! One might think these are odd choices for a Bollywood sequence, but somehow they seem to work, bringing the audience to its feet on both occasions. Things You Don’t Say to Your Wife also features somewhere in the sequence, adding to the general mayhem. Ruaan appears next. “I was stillborn. My mother didn’t want me, but I was still born”. He is a would-be musician who has a toaster hanging from his neck, on which he creates rhythms with two forks. Yes, folks, he plays a song with his “fork ‘n toaster”! And the song? What else – it’s his own composition called ….. you guessed it ….. Toast. Very funny, and very clever! Manic energy is very apparent in the finale – The Evolution of Dance in which Fabbri throws himself around, boogying his way through virtually every dance style from the 50s to the present. Hats off to whoever edited the music together for this non-stop, highly-polished sequence which would have exhausted any mere mortal. And just to prove that he is no mere mortal, Fabbri adds another finale – The Evolution of Drums in another cleverly-edited musical sequence, adding his own riffs and punctuation to a series of well-known hits from The Beatles, Phil Collins, Johnny Clegg, Bob Marley and Toto, to name but a few! Fabbri is a superb drummer, and obviously loves sitting behind his drumkit, jamming along with the maestros. All in all, this is a very entertaining show, but be warned – Gino Fabbri is Completely Nuts!